The 59th and last meeting for 2018 was held at the Marsa Racetrack on Sunday afternoon. The programme consisted of six races and the major event was the Mediterranean Derby final for flat horses on a long distance of 1,750m. This was won by French Setfiretotherain driven by Michael Sultana. Seven horses took part in the flat race final. Bognor (Demis Zammit) was the fastest horse out of the gates and opened a small lead from the other participants. However with 600m to go, Sultana started to increase the pace on the outside with Setfiretotherain. 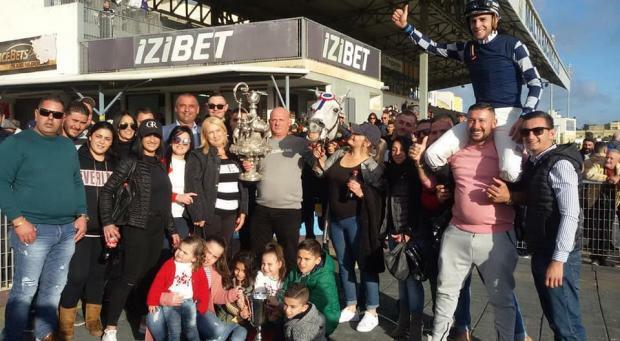 Sultana’s horse took the lead when the pacesetters turned for the final straight and sealed its third win in a row from Beykoz (Giuseppe Manuele) and Bognor. At the end of this final, MRC chairman Edwin Borg presented the prestigious Mediterranean Derby trophy to Michael Sultana and Joseph Cauchi, the jockey and the co-owner respectively of the winning horse in the presence of Charles Gauci, on behalf of the sponsors. Sunday’s card also included a class Premier race on a short distance of 2,140m. The race produced a keen tussle between four trotters in the final straight. It was Titan Du Closet (Ryan Bartolo) which took its second win in a row and its third in Malta from Royal In (Brian Debono) and Twist Des Baux (Kevin Mifsud). Tipol De Nappes (Michael Ghigo) finished in fourth place. After this last official meeting of the year, Rodney Gatt was confirmed as the best driver of 2018 with 103 wins. Dylan Baldacchino is the best youth driver with five victories and Cesar Du Buillon was the most consistent trotter with 12 wins.